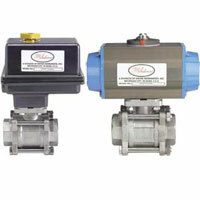 Save space while maintaining flow rates with the compact Series SAV-ST Angle Seat Valve. The pneumatic, externally piloted angle seat valve is operated by a single acting actuator with a mechanical spring for fail-safe operation. Select from either normally closed (NC) or normally open (NO) configurations. Bi-directional valves (normally closed) are designed for special applications that require flow in both directions and incorporate an anti-water hammer design for liquid applications flowing under the seat. 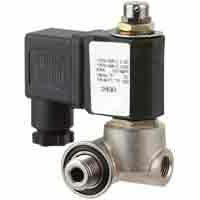 Normally open valves can also be used to prevent water hammer on valve closure in liquid applications. Constructed of investment case stainless steel and PTFE seals, the Series SAV-ST can be used in most gas, liquid, and steam applications. Integral heat sinks dissipate heat protecting the polyamide actuator, ensuring longer life. The Series SAV-ST can be mounted in any position. 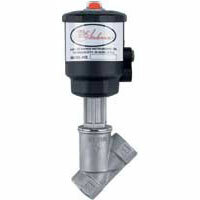 For added flexibility, the actuator housing rotates 360 degrees for positioning of the pressure ports. Standard visual indicator shows open or closed position. 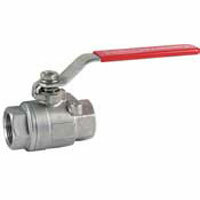 Valve Body: AISI 316L Stainless Steel; Plug and Stem: AISI 316L Stainless Steel; Stem O-ring: Fluoroelastomer; Seat and Seal: PTFE.